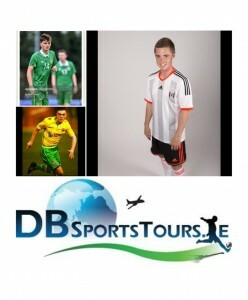 This week it has been confirmed three players working with DB Sports Tours will be a part of the upcoming series of friendly matches for Ireland under-18’s. The trio which includes Adam McDonnell, Anthony Dolan and Graham Kelly will all feature in consecutive friendlies against Portugal next week. Under-18 manager Pat Doolin named the squad ahead of the trip which should prove great experience for the young squad. The team are set to clash with the Portuguese in Abrantes next Tuesday, December 16, and then meet the same opponents on Thursday, December 18, in Bonitos. Both games are intended to kick-off at 3.00pm. The trio all ply their trade in England and hope to forge a professional career in the future. Adam McDonnell recently made the move to Ipswich Town, and has recently represented Ireland U19’s in their Euro 2014/15 campaign here in Ireland. Anthony Dolan on the other hand plays for Fulham, one of the leading clubs in England with regard to youth development, notably since the club recruited Malcolm Elias, who previously oversaw the youth development revolution at Southampton. Graham Kelly meanwhile plays for Sheffield United. Earlier this year notably Graham captained the 1997 Ireland side to wins against both Celtic FC and Hibernian. For information on how the lads get on keep an eye on the blog here.